Youth across the country protested, marched and rallied this past year more than ever. 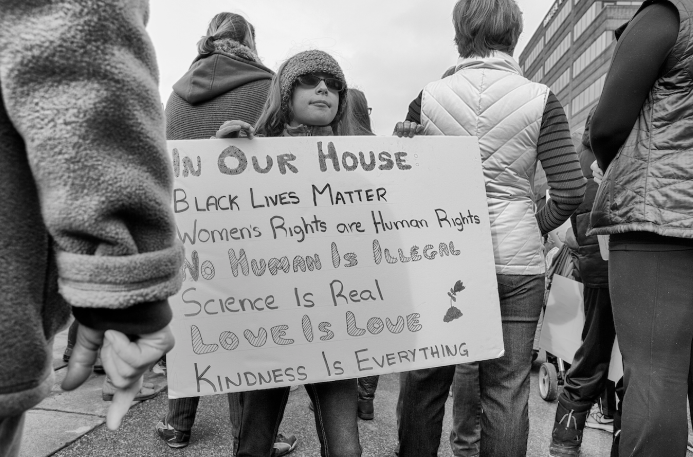 Pictured is a young girl at the Women March in Ann Arbor. Though we say those three words often, it is hard to grasp the idea of change fully. Change can come at any time and our generation can and will bring the change this world needs. Acceptance of this realization is hard and scary to come to. Knowing that you will never be the exact same as you are in this moment can be both an exciting and nerve-wracking idea: If you do not like where you are, great, you can change; if you feel you are living the perfect life, unfortunately, change will come anyways. Nobody can tell you how or when you are going to change, but it is impossible to stay in the same place forever. Change can be classified into two types: inevitable and inspired. Inevitable change is the type of change that we, as humans, have no control over. At Community High School, it is inevitable that the senior class will graduate in the spring, and a fresh class of 135 kids will appear in the fall. For those close to the seniors, this change may come as a disappointing one; for those with ties to the incoming freshman, or those just excited for new faces, this change is warmly welcomed. Change, like life, cannot be viewed in black and white; it all depends on what end of the change-spectrum you are on. The other type of change is inspired change. Inspired change is the conscious change that we decide to make in our lives. “Let us remember: One book, one pen, one child, and one teacher can change the world,” said Malala Yousafzai, a Pakistani feminist activist, who at the age of 17 was the youngest Nobel Peace Prize recipient. At Community High School we have the platforms to make change happen. With a staff who genuinely cares about the students; we have the possibility to create any club that we want, a diverse selection of classes to t every interest, fellow-students who only want to see each other grow into the person they want to be: there is every opportunity to make a change in life. Our generation (Generation Z) has been seen as one of social media, technology and independence. We would like to present a new model: we are the generation of change. Yes, we are on social media, but we use it to connect with people tens of thousands of miles away. Yes, we do use technology, but we will change the world with the programming we can do with it. Yes, we are independent, but we are independent enough to create our own thoughts and beliefs. Change is imminent and necessary. Without change, we would never advance; we would never learn more about the world around us; we would never grow as journalists, friends and people. Through our lives thus far, there has been plenty of change, but we — as journalists, Community High Students, Americans, members of Generation Z and global citizens — will make catastrophic change.